Heat oven to 350°F (325°F for dark or nonstick pans). Place paper baking cup in each of 24 regular-size muffin cups. In medium bowl, stir together flour, baking powder and salt; set aside. In large bowl, beat shortening with electric mixer on medium speed 30 seconds. Gradually add granulated sugar, about 1/3 cup at a time, beating after each addition and scraping bowl occasionally. Beat 2 minutes longer. Add egg whites, one at a time, beating well after each addition. Beat in lime peel and vanilla. On low speed, alternately add flour mixture, about 1/3 at a time, with milk, about 1/2 at a time, beating just until blended. Stir in lime juice. Divide batter evenly among muffin cups, fill each about 2/3 full. Bake 20 to 25 minutes or until light golden brown and toothpick inserted in center of cupcake comes out clean. Cool 5 minutes. Remove cupcakes from pans to cooling racks. Cool completely, about 30 minutes. Meanwhile, in large bowl, beat cream cheese and butter until smooth and fluffy. Beat in strawberries until well blended. On low speed, beat in powdered sugar until smooth and spreadable. Frost cooled cupcakes. Refrigerate 1 hour. 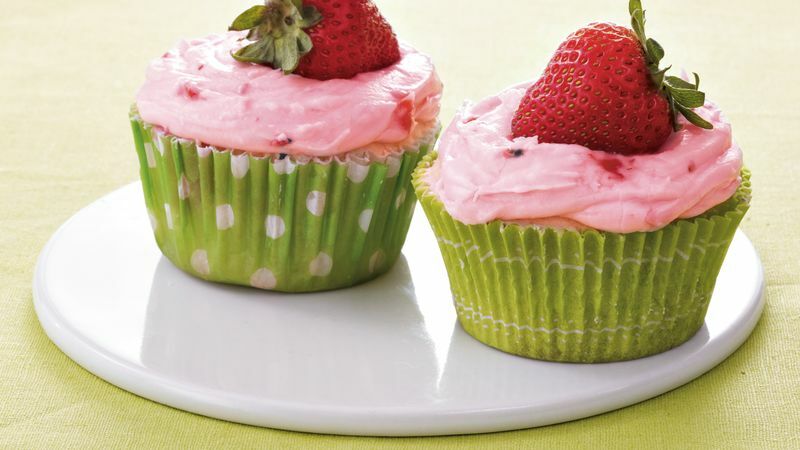 Before serving, garnish each cupcake with strawberry. Store in refrigerator. Place frosting in disposable decorating bag or large resealable freezer bag with one bottom corner cut off to create a 1-inch opening. Pipe frosting in a circular motion over cupcakes for a bakery-shop look. For a raspberry cream cheese frosting, replace the strawberries with 1/2 cup drained mashed raspberries. Make it special by purchasing themed paper baking cups. You can find them in many grocery stores or anywhere cake-decorating supplies are sold.